Kuchipudi (తెలుగు : కూచిపూడి pronounced as Koochipoodi is a Classical Indian dance form from Andhra Pradesh, a state of South India. Kuchipudi is the name of a small village in the Divi Taluq of Krishna district that borders the Bay of Bengal and with resident Brahmins practising this traditional dance form, it acquired the present name. The performance usually begins with some stage rites, after which each of the character comes on to the stage and introduces him/herself with a daru (a small composition of both song and dance) to introduce the identity, set the mood, of the character in the drama. The drama then begins. 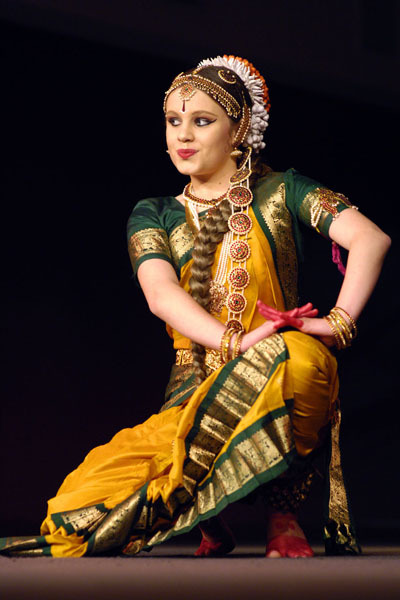 The dance is accompanied by song which is typically Carnatic music. 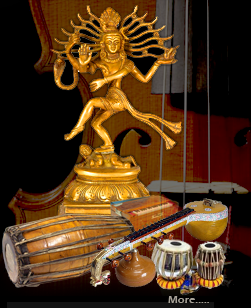 The singer is accompanied by mridangam (a classical South Indian percussion instrument), violin, flute and the tambura a drone instrument with strings which are plucked. Ornaments worn by the artists are generally made of a light weight wood called Boorugu. Some of the well known people in this tradition are Dr. Vempati Chinna Satyam Guru Jayarama Rao and Vanashree Rao Vedantam Lakshminarayana, Dr. Uma Rama Rao, Tadepalli Perayya, Chinta Krishna Murthy, Vedantam Sathya Narayana Sarma, Dr. Korada Narasiha Rao ,Sobha Naidu, Pasumarthi Venu Gopala Krishna Sarma, Raja Reddy and Radha Reddy swagath kuchipiudi, Mahamkali Surya Narayana Sarma, Dr. Yashoda Thakore, Sarala Kumari Ghanta, Yamini Reddy, Vijayapal Pathloth, Vamshee Krishna Varma. The prominence of Kuchipudi dance form is not limited to India alone. There are now a number of popular Kuchipudi teachers, choreographers and dancers in North America and Australia.